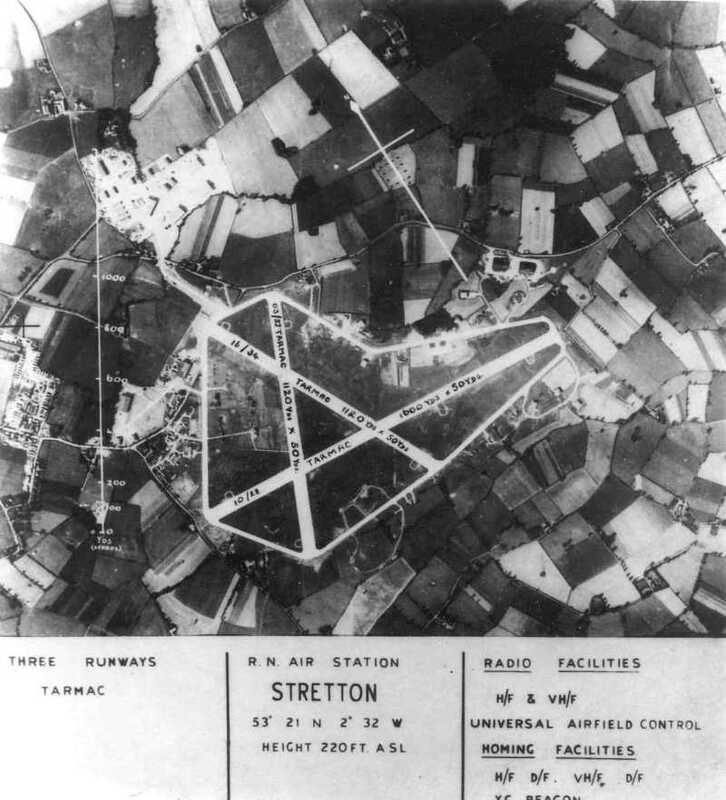 Stretton Airfield (also known as Royal Naval Air Station Stretton or HMS Blackcap), was an airfield 265 kilometers north of London. It was originally planned as a Royal Air Force night fighter station, protecting the cities of Liverpool and Manchester from Luftwaffe air raids during World War II. Changes in German tactics (they stopped bombing British cities) meant that the airfield was no longer required and so it was transferred to the Admiralty on completion in exchange for facilities at Macrihanish. Having been designed as a standard RAF airfield, three runways and numerous hangars had been built. RNAS Stretton was commissioned as HMS Blackcap on 1 June 1942. 41 Fleet Air Arm Squadrons were based here for varying periods with some aircraft being flown directly to and from aircraft carriers operating in the Irish Sea and other nearby waters. Strettons total complement was 1462 personnell, but it also had a sizeable amount of civilians. Fairey Aviation used a hangar on the northeast edge of the airfield for the modification, repair and flight-testing of Barracudas, Fireflies and Fulmars before they were sent to their operational squadrons. From 1944 HMS Blackcap was also used as an Aircraft Maintenance Yard (AMY). A large hangar complex had been constructed to the northwest of the airfield specifically for this activity. Aircraft access to the AMY was via a taxiway crossing Barley Castle Lane, a police post manned by Royal Navy Police was set up, to stop traffic and allow the plane to cross. Two Wrens checking the equipment in a Vought-Sikorsky Chesapeake on its arrival at Royal Naval Air Station Stretton, Lancashire. WRNS are now doing maintenance work at the aerodromes where Fleet Air Arm planes are overhauled. They check over planes when they arrive or leave to ensure that each one has its correct equipment, do gunnery maintenance and photographic work. The Chesapeake was a British version of the Vought-Sikorsky Vindicator (THE ROYAL NAVY DURING THE SECOND WORLD WAR © IWM (A 15139)). 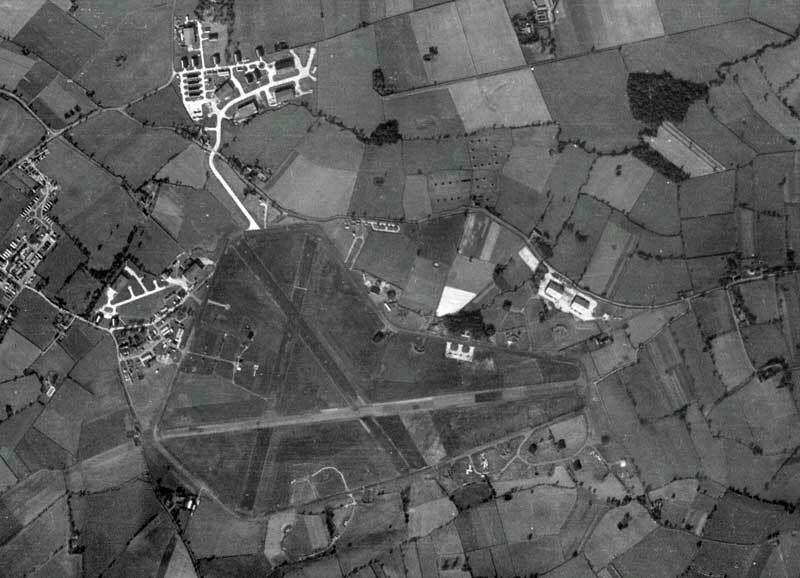 1945 photo of the airfield (Google Earth). At the end of the war American naval aircraft (Hellcats, Wildcats, Corsairs) were flown into RNAS Stretton to be broken up for disposal. The Aircraft Maintenance Yard at HMS Blackcap meant that the airfield continued to operate in spite of the large reductions in the Fleet Air Arm and Naval Air Stations and, at its peak, the airfield handled one third of all Fleet Air Arm Aircraft and all of its spare engines. In 1947 the Fleet Air Arm decided to form Royal Naval Volunteer Reserve Squadrons. The first to be based at RNAS Stretton was 1831 Naval Air Squadron, a fighter squadron, which was reformed here on 1 June 1947. It was joined on 18 August 1952 by 1841 Naval Air Squadron, an anti-submarine squadron. Together, these two squadrons comprised the Northern Air Division which was formed at Stretton on 1 June 1952 and disbanded on 10 March 1957 together with its constituent units. 767 Naval Air Squadron, operating Supermarine Attackers, was also based in Stretton until 1957. The last squadron based at HMS Blackcap was 728B Naval Air Squadron, formed on 13 January 1958 to operate Fairy Firefly U.9 target drones. It formed here because of the proximity to Fairy Aviation at Ringway, where the Fireflies were converted. The squadron was relocated to HMS Falcon, RNAS Hal Far, Malta, on 15 February 1958 . The airfield was closed on 4 November 1958. 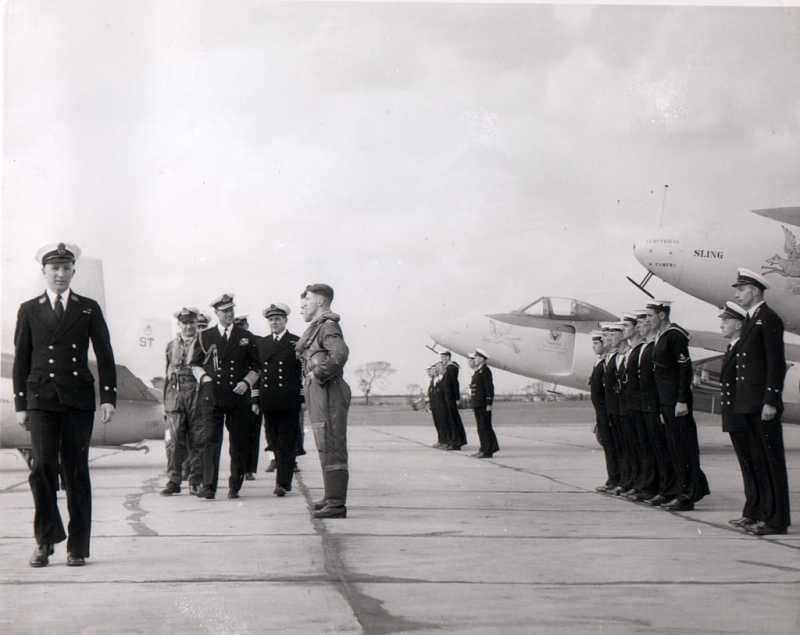 HRH Prince Philip, the Duke of Edinburgh, visited RNAS Stretton on 17/18th May 1956 to inspect the Northern Air Division (forums.airshows.co.uk). 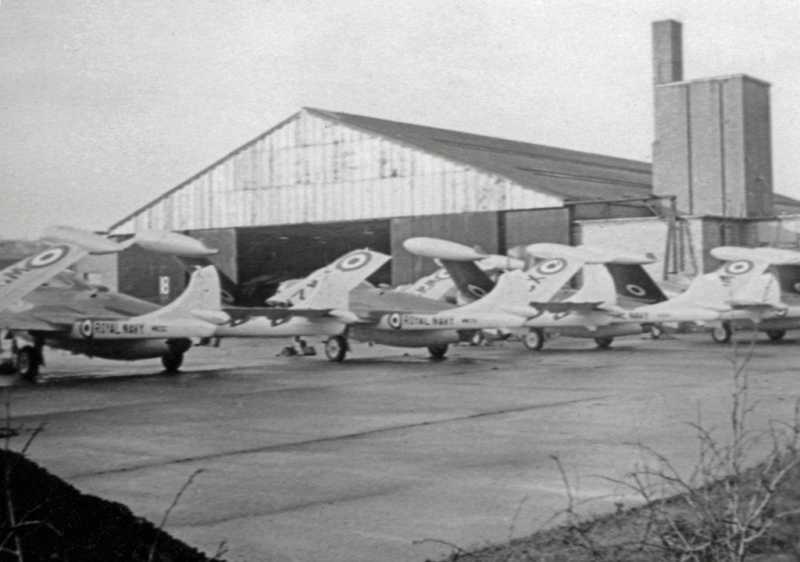 Five DeHavilland Sea Venom FAW.21s at RNAS Stretton's Aircraft Holding Unit in June 1956, with WW276 being second from left and XG614 to its right (© R.A.Scholefield, used with permission). Today there is not much left of HMS Blackcap apart from the main runway, which is still in remarkable good condition and parts of the perimeter track, a few of the old hangars are scattered round and about, used mainly for storage and distribution along with the Stations Telephone Exchange, last used as a cattery (and not, as some think, the Royal Navy Police dog unit). Shell used the airfield to test engine oil and they built a control tower (not to be confused with the origional tower, which is long gone). A few of the original building are still standing north of the motorway, but you need to look out for them, as many are within Appleton Thorn Industrial Estate. A lasting memorial to HMS Blackcap and those who served there can be found in the graveyard at St Cross Church, Appleton, being the graves of personnel who were killed at Blackcap whilst serving there. It includes two graves of two young Free Dutch Naval Officers serving in the Fleet Air Arm, killed when their planes collided over Budworth Mere whilst practicing for the D Day Landings. On every Remembrance Day two crosses of Poppies appear on their graves with a handwritten note of condolence in Dutch, although it is known that they have no living relatives, somebody places the crosses there. The remains of Stretton in 2005. 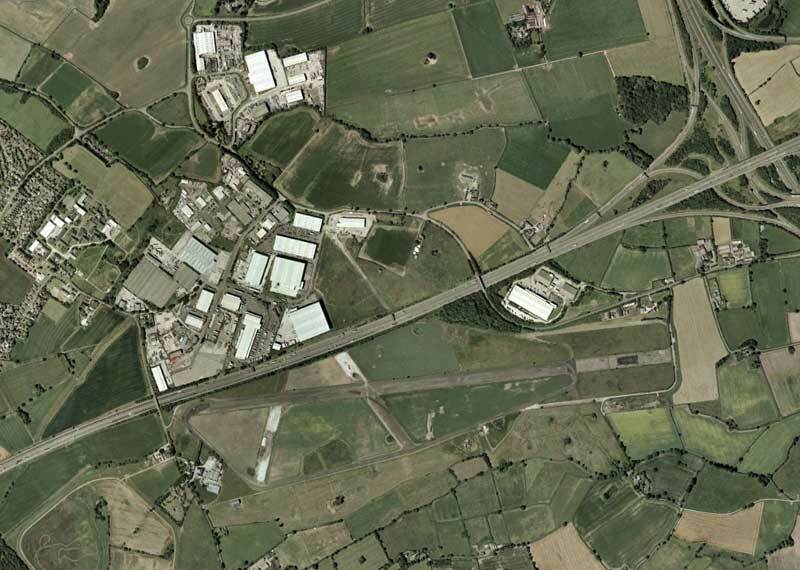 The construction of the M56 motorway split up the airfield. The north side was largely built over by an industrial area (Google Earth).